Results from a virtual teardown from IHS iSuppli were made public on Wednesday, revealing that Apple pays an estimated $207 to build the base model 16GB iPhone 5, a cost slightly higher than last year's iPhone 4S. The market research company noted in its report that while previously-expensive NAND flash memory prices have dropped, the iPhone 5's display technology and 4G LTE wireless components brings the build cost up to $207, or $8 more than consumer pricing after wireless carrier subsidies. 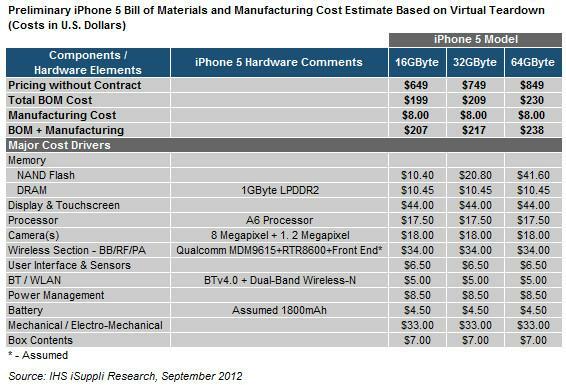 In comparison, the bill of materials, or price without labor costs, for last year's iPhone 4S was estimated to be $188. In total, the iPhone 5 is estimated to have a BOM of $199, while the 32GB model rises to $209 and the 64GB version jumps to $230. With a manufacturing cost of $8 across the line, the final cost comes out to $208, $217 and $238 for the 16GB, 32GB and 64GB models, respectively. A report last Friday from UBM TechInsights pegged the 16GB iPhone 5' BOM to be around $168, substantially lower than the IHS estimate. The most expensive part in the iPhone 5 is the new 4-inch display which comes in at $44. Apple is sourcing its screens from multiple suppliers, including LG Display, Japan Display and Sharp, as manufacturing the cutting-edge in-cell displays is complex and results in relatively low yield rates. Instead of sandwiching the touch sensing layer between glass substrates, Apple's in-cell technology integrates the capacitive components with the LCD array, thus doing away with at least one layer of glass. The company is expected to be using a $34, LTE-capable wireless system from Qualcomm similar to the one found in the iPad 3. However, the new iPhone's subsystem swaps out the first-generation MDM9600 baseband processor for the more advanced and power efficient second-generation MDM9615. In previous years, NAND flash memory was one of the more costly components, however current prices have nearly halved in less than one year. Finally, the firm is estimating Apple's new A6 processor is a bit more expensive at $17.50 than the A5 found in the iPhone 4S, which cost $15 in 2011. A more comprehensive analysis of the new handset's internal parts is expected to be completed later this week, when the iPhone 5 hits store shelves on Friday.